Equine recurrent uveitis (ERU) also known as moon blindness is a serious eye condition that has plagued horses and horse owners for centuries. ERU causes painful eyes and is the most common cause of blindness in the horse. Unfortunately the inciting causes can be difficult to identify and the entire syndrome is still not completely understood. There are new treatments that have given relief to horses that suffer from this condition. Uveitis refers to inflammation of the uveal tract of the eye. The uveal tract is made up of the iris (the colored part of the eye), the ciliary body (produces the fluids in the eye), and the chorid (the back part of the eye that supplies nutrients to the eye). Recurrent uveitis is inflammation of the uveal tract that recurs periodically. The inflammation can recur so frequently that it is almost constant or recur so infrequently that years can elapse between episodes. Each time inflammation recurs it does a little more damage to the eye, eventually if not controlled ERU can cause blindness or require removal of the eye. Episodes are of varying degrees, some horses are quite painful while other horses only deal with mild inflammation. ERU can affect one or both eyes. Twenty five years ago when I was shoeing horses I heard an older veterinarian explain that moon blindness (ERU) was due to the phase of the moon. Even twenty five years ago we probably knew that the moon had nothing to do with ERU; but the fact that this veterinarian was taught this theory and still believed the moon incited inflammation shows how desperate veterinary medicine was to explain the inconsistent nature of ERU. Today we have a better handle on the causes of ERU; however - we still do not understand the entire syndrome. It starts with an insult to the eye. This insult can be traumatic in nature such as a blow to the eye or it can be infectious in nature such as the bacteria Leptospria, equine influenza virus, or the parasite strongylus. Once the inciting cause has resolved it is believed that the recurrent inflammation is immune mediated. It is caused by the over reaction of the horses own body to its own immune cells. Horses with ERU may have swollen eyelids and they may squint or keep the eyelids closed. The eyeball may appear reddened. The sclera or cornea may be reddened and inflamed. The cornea may appear cloudy. The eye may be tearing or have a mucous discharge. Some horses will rub their eye and complicate ERU with corneal damage called corneal ulcers. If your horse’s eye displays any of these characteristics, you should call your veterinarian. The goal of treatment is to limit or reduce inflammation in the eye which will decrease damage to the eye and preserve vision. Of course limiting inflammation also helps control pain. Horses that have an inciting cause that can be identified get direct treatment for that cause. Most horses however have long recovered from the inciting cause so treatment for these horses is aimed at limiting the bodies exaggerated reaction to its own immune cells. Typically we attempt to control inflammation with a combination of systemic drugs and drugs applied topically to the eye. We use steroids, antibiotics, and nonsteroidal anti-inflammatory drugs. In most cases we are able to manage inflammation with these drugs. Unfortunately we are not always able to manage inflammation. 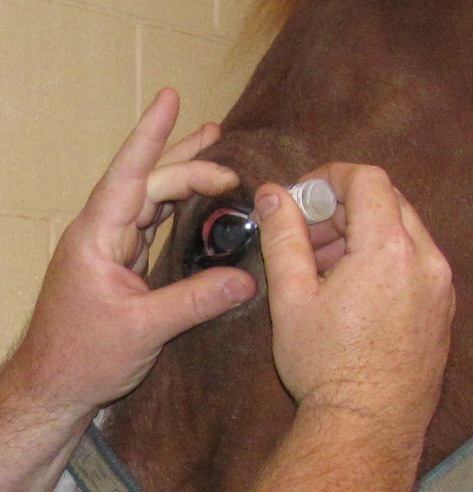 Horses with uncontrolled ERU or frequently recurring ERU may need ocular cyclosporine implants. These are implants that are surgically implanted in the eye and continually release medication to control inflammation. In some extreme cases the pain associated with ERU is uncontrollable and the eye must be removed for the comfort of the horse. Over time repeated insults to the eye can cause corneal scarring, cataract, degeneration and shrinking of the eye, and blindness. Timely and aggressive treatment with each episode is necessary to attempt to prevent these long term outcomes. If you suspect your horse has an eye issue, call your veterinarian for evaluation and treatment as soon as possible.